The definition of extreme reads: highest in intensity or degree. 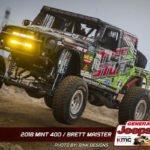 The General Tire Jeepspeed racing series saw some drastic extremes during the season opening Best in the Desert Parker 425 in Parker, Arizona. Probably the most extreme was the condition of the course. On the first lap, it was fairly typical for Parker; deep sand, big rocks and miles of whoops. As the laps clicked off, the course got much worse. 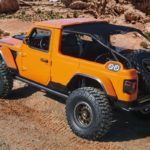 The unlimited cars and trucks would run three laps compared to two for the less exotic Jeepspeed Challenge and Jeepspeed Cup trucks. As the Jeepspeed racers headed out on their second lap, the course was actually three times worse. Attrition was high in every class as were the stories of shattered wheels, flat tires and suspension parts torn from their chassis. The Jeepspeed field included 19 class 1700 Jeepspeed Challenge trucks and 5 Class 3700 Jeepspeed Outlaws. Only ten from the original 24 would finish. 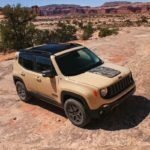 The simple, easy to comply with rules in the Jeepspeed series, that allow you to build your own vehicle, have produced an evenly matched yet diverse field of vehicles. Like the vehicles they race, the competitors themselves are equally as diverse. 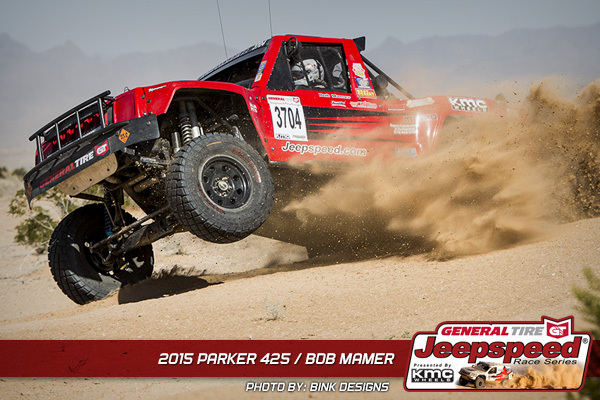 Take the two class winners at Parker. 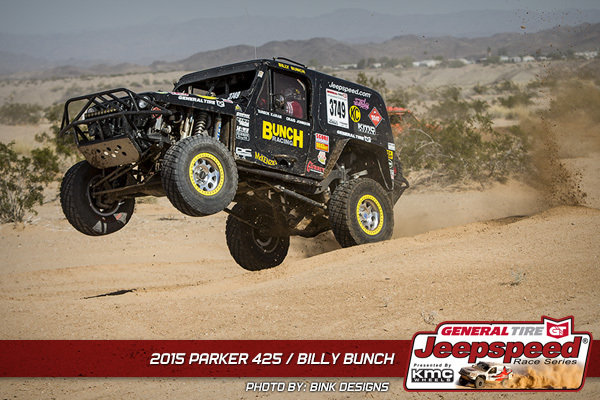 Class 3700 Jeepspeed Outlaws was won by Billy Bunch. Bunch has numerous wins and championships having raced in the Jeepspeed series since its inception. Bunch continues to be very competitive at 71 years of age. 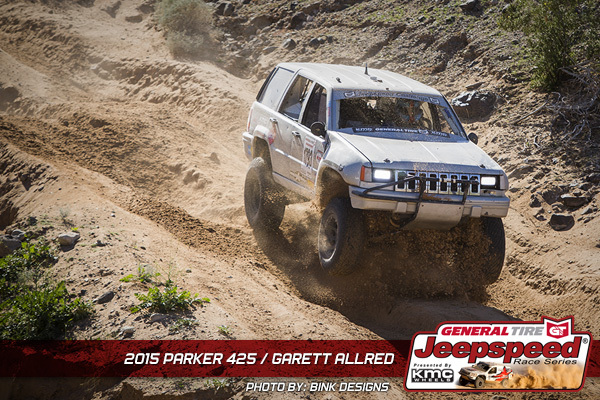 The Class 1700 Jeepspeed Challenge winner was 18 year old rookie Garett Allred driving in his first race. The Jeep Grand Cherokee Allred was driving is four years older than he is. The Cherokee is new to him but not to his father Brad. 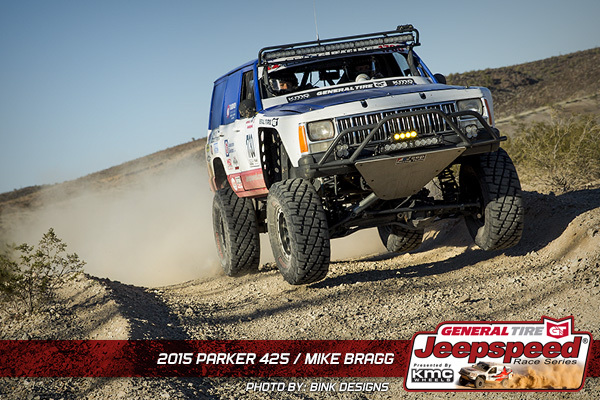 Brad used to race years ago and spent time working for and racing with the legendary Don-A-Vee Jeep racing team. When Brad and his wife were expecting their child, Brad retired from racing to raise his son. Fast forward to 2015 and the younger Allred is ready to go 4 wheel racing after spending years competing on bikes. They go looking for a truck to race and find the Cherokee affectionately called “old grand dad” by the most recent driver Skyler Gambrell. In an incredible twist of fate, the elder Allred had a hand in building “Old Grand Dad” when he worked at Don-A-Vee 20 years earlier. Third place Mike Bragg got off to a slow start. They made it all the way to the midway pit before the crew was able to trace down a loose plug wire at the distributor. They then hit a pipe sticking out of the ground that damaged one of his KMC wheels. “We heard on the radio that we were running third and then saw Randall pulled off to the side putting us in second,” said Bragg, “We were on the last lap when the brakes started locking up. We stopped to bleed them, that’s when Seubert went past us. It was exciting to have so many entries. It’s fun to race against a lot of trucks; especially when it’s so competitive. The new passing rules for the unlimited cars worked really well; I never got nerfed once.” Mike used to race in class 8 but came to Jeepspeed for the tougher competition. Third place in 3700 was Bob Mamer who followed Mack and Bunch into the finish. Fourth place went to the big bad 3750 class Dodge of Tom Barnett. Whether it’s Jason Mack, Garett Allred or Cole Seiber, Jeepspeed is full of fast rookies this year. The youngest of the bunch is 15 year old Cole Seiber of Parker, Arizona. 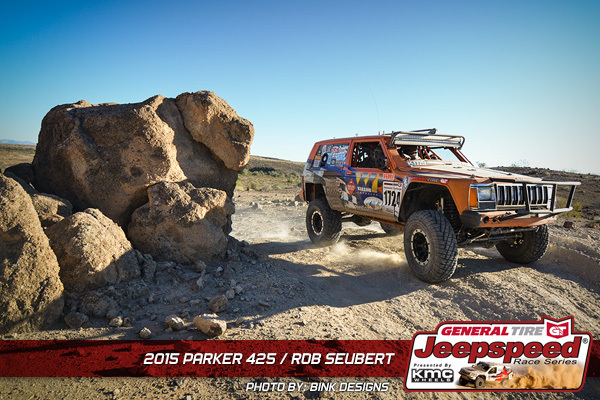 Cole was right in the mix too; finishing 4th in Jeepspeed Challenge class 1700. 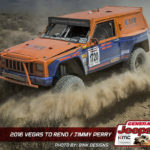 These drivers have figured out that Jeepspeed racing is the best way to get their off-road racing careers started. Strong support from sponsors and the ability to build your own vehicle makes it affordable, competitive and exciting. 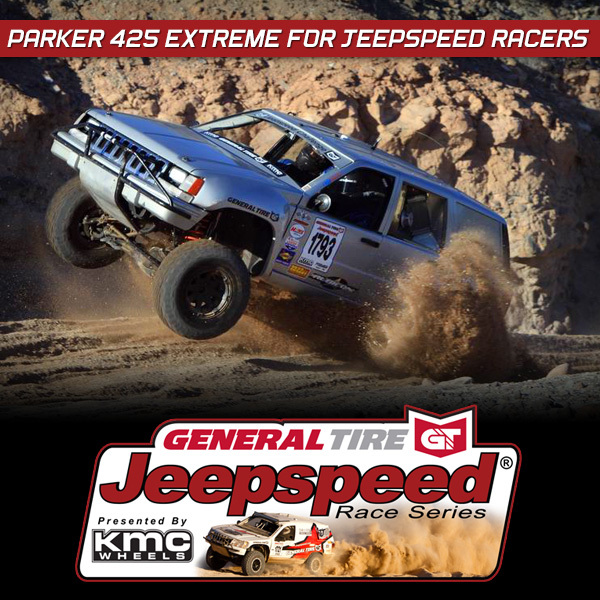 Sponsors of the series include General Tire, KMC Wheels; now the Official Wheel of Jeepspeed; taking over from their sister brand ATX. 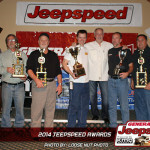 The Wheel Pros Group has sponsored Jeepspeed for more than 10 years now. 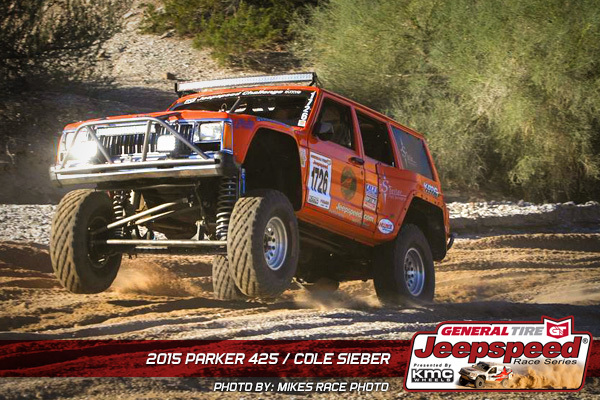 Premier Chrysler Jeep is the Official Jeep Dealer and Presenting Sponsor of the Jeepspeed Desert Racing Series’. Currie Enterprises returns as the Official Axle of Jeepspeed. King shocks are the Official Shock of Jeepspeed. 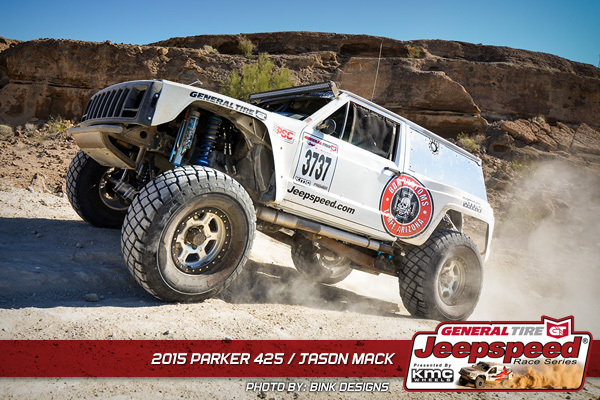 G2 Axle & Gear is the Official Gear supplier of Jeepspeed. Rubicon Express is the Official Suspension of Jeepspeed. (Winner Garett Allred and third place finisher Mike Bragg were both racing on the Rubicon express, long arm suspension). SmittyBilt is the Official Off Road Equipment supplier of Jeepspeed. 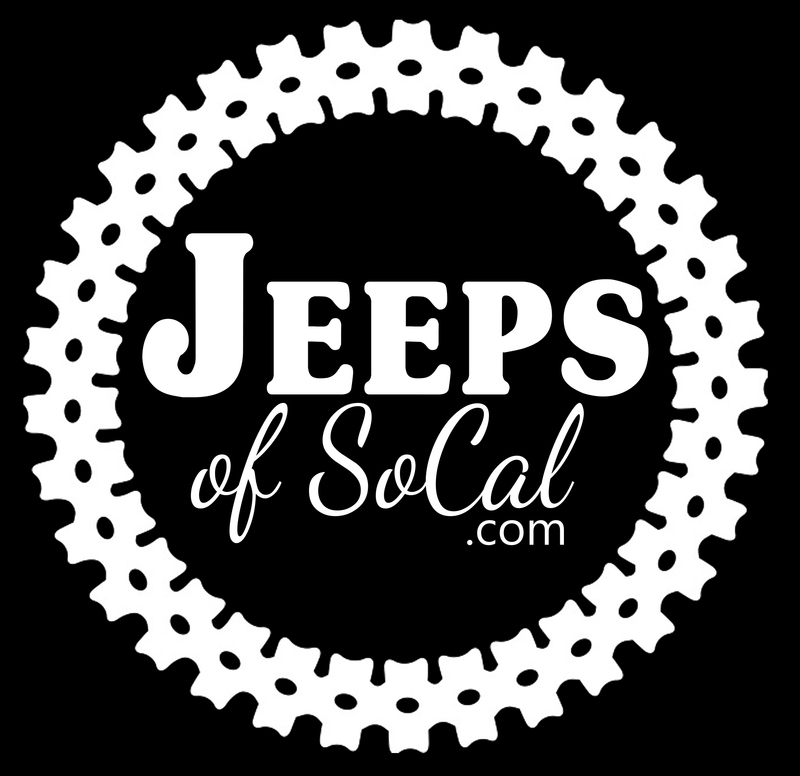 PAC Springs is the Official Spring of Jeepspeed and KC HiLites is the Official Light of Jeepspeed. Jeepspeed Official Suppliers continue to be a vital part of our teams’ success also and a huge asset to the Jeepspeed series. Approved supporters and product suppliers also include Rock Krawler Racing Developments, Synergy Mfg., Jaz Fuel Cells, Poly Performance and Howe Performance. Jeepspeed Racers Prove, It’s Not Over Until It’s Over At .. 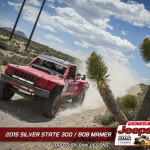 If there is one thing that characterizes the level of competition in the General Tire Jeepspeed Desert Race Series presented by KMC Wheels and Premier ..
General Tire Jeepspeed Series Celebrates 2014 As 2015 Season Nears Orange, CA With the 2014 General Tire Jeepspeed racing champions decided, it .. 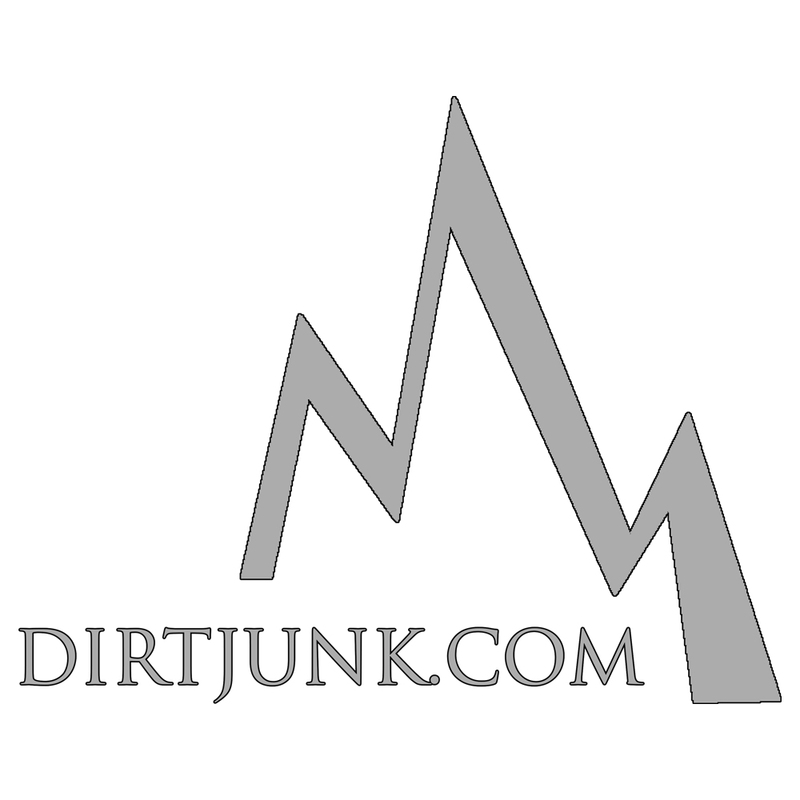 Tagged desert, jeep, jeepspeed, racing.